Here at Byteko we are happy to introduce CupNotes™, a lightweight and easy-to-use tool that helps you manage your quick notes easier. 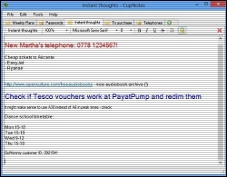 CupNotes™ is a perfect single place for keeping your instant thoughts, supermarket to-buy lists and writing down telephone numbers. CupNotes, our new quick notes product, is released. You are welcome to download it here. FineAnces 2.0 released. You are welcome to download it here. FineAnces 2.0 (release candidate 2) released. You are welcome to download it here. FineAnces 2.0 (release candidate 1) released. You are welcome to download it here. Byteko is a group of independent professional software developers located all over the world, specializing on small and medium-sized end-user and server software products. For 6 years in business we supplied a number of successful solutions for private customers and small enterprises. Our team consists of highly-skilled software developers and architects, who guarantee the highest level of product quality. Besides offering software development services, we market several public products that we developed for ourselves. The products make our work more efficient, and we hope they will do the same for you.